Someone once told me that the Keystone Oaks school district was cleverly named to reference each of its three communities in the name. This would be the Oaks. You'll have to wait to find out about the others. Brendan's keen eye spotted this sign just as we exited 79. While this isn't the "tree-lined suburb" of Mt. Lebanon, Green Tree did, at least at one point, have a giant sycamore along the side of the main drag. 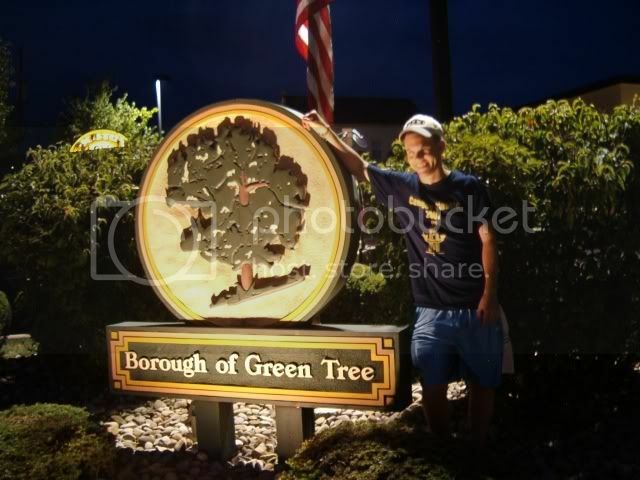 Photography may have been taboo back then, but an artist's rendition of the tree is available on the borough's welcome sign.